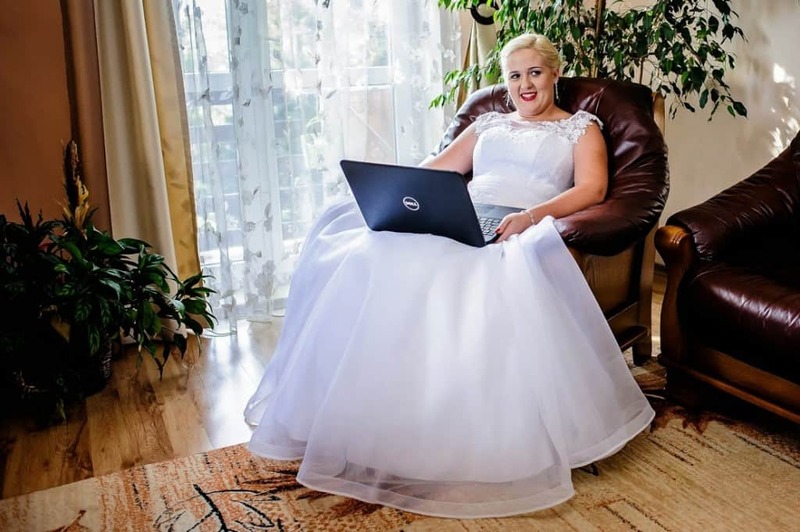 Can you think of other easy ways of making money online and jobs abroad for couples? Let us know in the comments! You are probably used to thinking about how to make money to travel, but we want to show you how to make money and travel at the same time. There are thousands of ideas we have about how to become a digital nomad on the internet. It is easy to start traveling and working abroad when you are young and single. For some people though, being in a relationship is a big obstacle. But we can’t understand why! There are so many ways to make money online for couple. As you learn how, you’ll change your mindset from thinking how to make money for travel to thinking how you will make money and travel at the same time. We both have been working online for almost 5 years. We are traveling the world together and live a location-independent lifestyle. When we started, what we were doing was pretty unusual. Thankfully, it’s getting more and more popular every year. 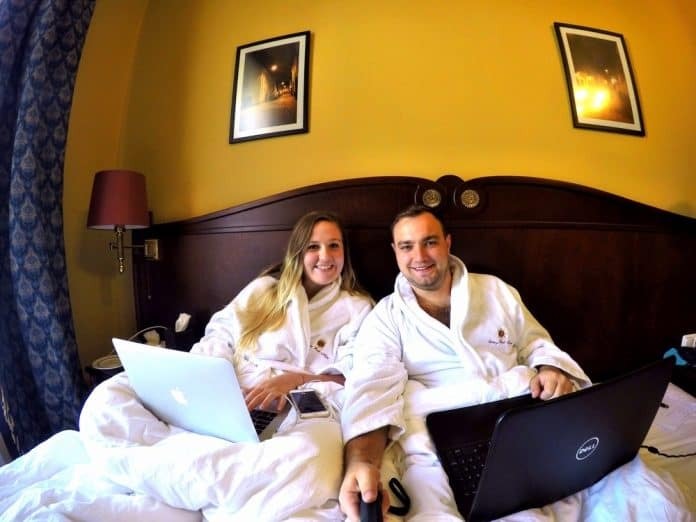 We are meeting digital nomad couples all over the world. In this post we are giving you the best ideas on how to make money online for couple. We will also recommend sites with job offers for couples. Hopefully, Instagram photos from our travels, showing the awesome places where we work online, will give you some inspiration. 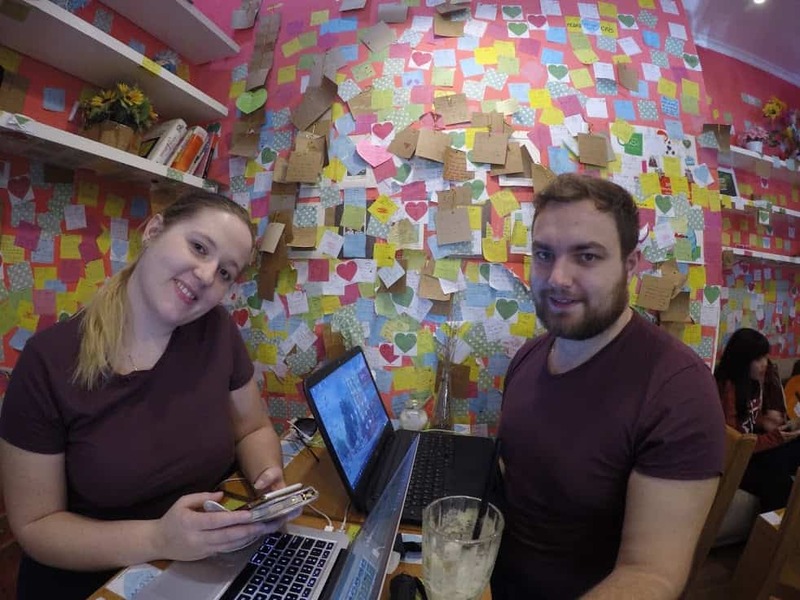 Being a digital nomad couple is one of the best things that we have achieved in our lives so far. 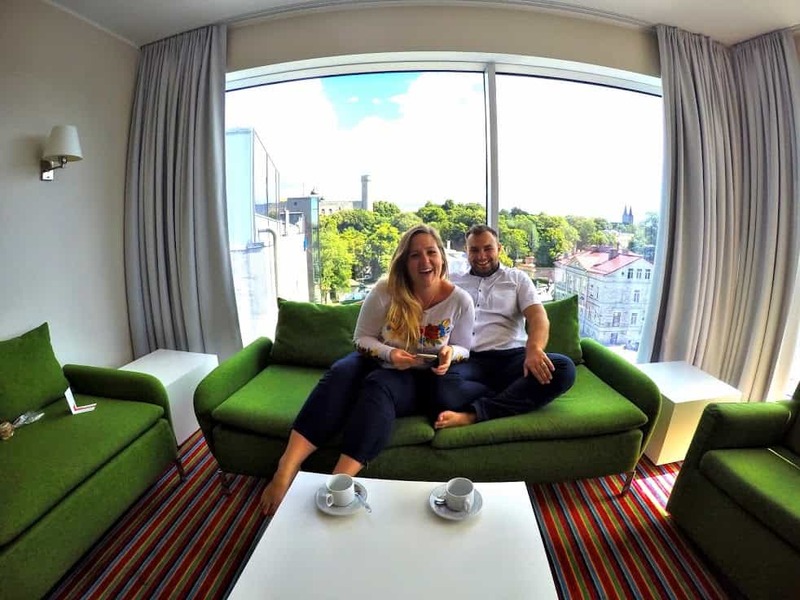 We’ve just checked in to a new hotel in Tallinn and we love it so far! This if the last one from top three freelance websites. Upwork is where we personally earn the most money. It is one of the easy ways to make money online as a freelancer. Check out more freelance websites here. This is what we are doing right now! Professional bloggers can earn a lot of money online. This is even how teens make money online. 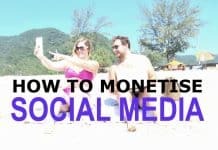 They are getting paid for going on their trips, publishing sponsored posts on their blogs, promoting brands or companies on their social media and many more. What does it mean in practice? Making money while you are sleeping. Or, if you love wildlife, this means you can learn how make money online in Nigeria on a safari, with no computer around! With affiliate programs, you will have to do nothing to earn. 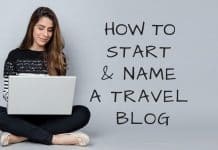 Starting your own travel blog is really worth it. This may surprise you, but it costs almost nothing to start. The most basic plan that the biggest hosting provider, Blue Host, costs is less than $4 monthly (USD). Everything is included in that price, even registering your domain name (web address)! If you have some money to invest, we recommend that you buy Nomadic Matt’s blogging course. He’s one of the most famous travel bloggers in the world, so you won’t regret a single penny you spent on his course. We’ve been following him since 2014 and he still has a lot to teach us. For us, blogging is the most rewarding thing we have ever done. It’s a hard and time-consuming job but we really feel that we are creating something unique that helps a lot of people travel. It’s one of the top jobs for a couple who wants to work on something together. The busy life of digital nomads! Think about all the skills you have, either individually or as a couple. You can use them by becoming online teachers! If you love kids and are wondering how make money online at home, you may have found your calling! Tutoring is a great way to make money on the Internet. You can teach foreigners your language and help students with maths, physics or anything you are good at. The best part is that you don’t necessarily need a degree to start. Let’s take the English language as an example: in many countries in the world, being a native speaker is enough to become a tutor. This is so simple that’s it’s even how teens make money online. How awesome is that? Traveling and working abroad are awesome, especially on the beach! Selling products online was our first job. We think it’s a great thing to do for couples: you can find innovative ways to sell the products by brainstorming and coming up with creative ideas together. It’s up to you whether you chose to sell on your own online store or on the platform like Amazon. You can either sell your own products, work in a drop shipping business model or sell someone else’s products as a freelancer. 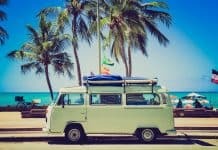 Any way you choose, you can make money travel and have fun all at once! We love our suite! It’s big enough for us to work in a separate area. Our life is magical 😍 we dreamt about something for a long time and then one day we woke up in the morning and realized that it was no longer a dream…it’s our real life right now! Again, you can use the skills that you have with this job. The sky is the limit in the consulting. This is one of the best ways of making money for traveling and working abroad if you are a master at what you do. Couples working together will find that they can make so much income just by advising others how to make money at home online. When you master your skills, you can get paid to teach people how to do it. You can become a social media consultant, sales consultant, marketing consultant or even…relationship consultant. It all depends on you! Think about the skills that you already have and try to find customers who want to pay for your knowledge. Simply by teaching others how to go from thinking about how to make money to travel to actually making money while traveling, you can earn a living! This is a great way to make money online for couple. What’s absolutely awesome is that you don’t need many skills to become a basic virtual assistant. This is one of best ways of making money online if you love to support others. If you’re wondering how teens make money online, this is one of the jobs that they start with! 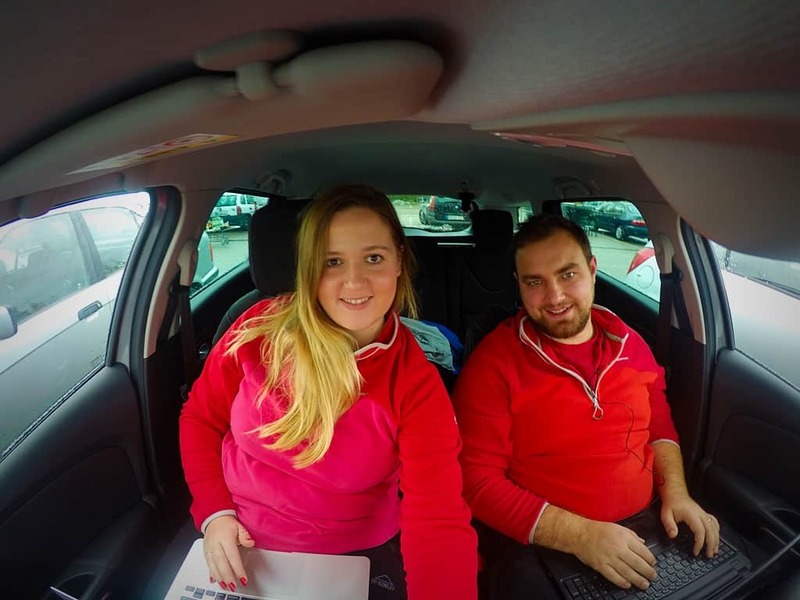 It’s a great job to start your adventure as a digital nomad couple! Sometimes we need a work break, but we don’t have to go far…the pool is right outside our room! What’s beautiful is that it’s a great opportunity for you to grow as a couple. Your business may be your mutual passion. We have been running a company together for almost three years, and we treat it as our baby. We think this is one of the most ideal jobs for a couple who are traveling and working abroad. Of course it will be also a big test for your relationship. We have noticed that most couples who work together have a great relationship, but spending so much time together may kill the romance, so think twice before starting a business. For us it was great, but some people have the completely opposite experience. If you are both independent-minded, this is probably the best way to make money online. Can you imagine a better workplace? If you are reading this article, it means that you speak English. Do you know any other language? If so, you can make money as a translator. It’s a great example of how make money online without investment. We even work while on the go sometimes! Taking a spa break! We are so grateful for the life we have. 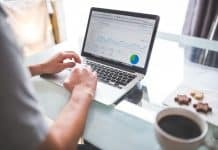 Helpful post, would also add that dropshipping is tougher than most people think – I’ve met many new dropshippers who gave up after being unable to generate any or minimal profit from their store. A huge problem is because they are selling generic made in China stuff and these Chinese factories have caught on to the dropshipping method and are undercutting all the dropshippers. That’s true, dropshipping is a though business but it’s possible to make profit out of it. Maybe sending good from China is not the best idea but there are many niches that are ready to give you money. Thanks Karolina a good article. I can’t help thinking you guys look like us on holidays in the top photo haha. I like your slant on diversifying, of all the successful lifestyle online business people this seems to be a common them. It seems like you guys are onto that idea as well…good on you for making a success of it! Thanks Ramon! All the best to you. Great tips indeed! 🙂 Its worthy! Make money online isn’t so tricky but easy enough if I use the right path to do anywhere. But, the idea you discuss on the article is totally impressive and exceptional tips. Thank you, Karolina. 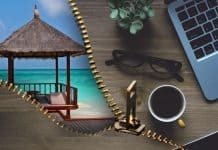 This article is an encouragement for me that started my path to be a Digital Nomad. I’m working to reach this goal with my partner. This is the best way that seminars are going on for earning online….. I liked this tip “so it’s better if you specialize in one thing at the beginning” because there are many people who want to apply various techniques at the same time. But none of them work right because it has no focus!